The plan was to actually eat at Ippudo. We got there at 3:35. They close at 3:30. And there were still people waiting to be seated that had arrived before 3:30. Drat! So we were denied! 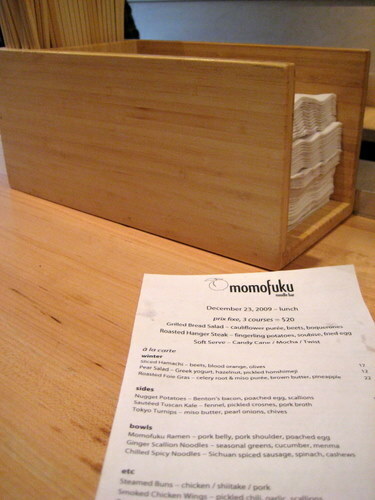 So we walked a few more blocks over to Momofuku Noodle Bar. If they were closed, I was going to freak! Luckily, by there time we got there around 4, we grabbed the last two seats at the bar! Score! There’s bar seats in the front, bar seats in front of the open kitchen, and a bunch of shared tables with benches. The place is clean, modern, and cute, yet still fairly no frills. 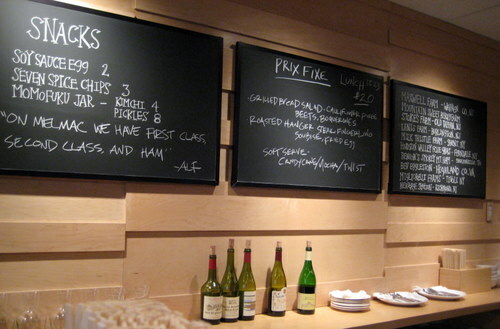 They have a fixed price lunch special, and the chalkboard on the right lists all the farms where they get their ingredients from. This place is like super famous, you know it is. And for a place called a noodle bar, there’s actually very few noodles. There’s very few items on the menu, period. But there was really no use in perusing the small menu at all. You come here for two things. The famed steamed pork buns. Were they all what they were cracked up to be? In a word, YES. The steamed bun is warm and soft. The pork belly is absolutely gluttonous, and melts in your mouth. There’s a hint of hoisin and sliced scallions and some sliced quick pickled cucumbers. It’s everything I thought it would be, and more. This lived up to the hype! We could have eaten many many more of these! I would not mind if I had these every day. 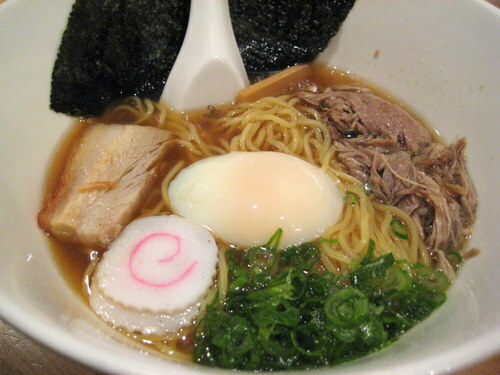 As famous as the pork buns are, the momofuku ramen is just as famous. So we split a bowl of that. They’re all about the oink here, so it’s a pork based broth, with more of the pork belly, and some pulled pork shoulder. Also there’s some nori, soft boiled egg, fish cake, bamboo shoots, and scallions thrown in there as garnish. The noodles are extremely firm here, or as A called them, “toothy”. We both enjoyed this ramen very much. For your veggie heads, don’t even bother coming in here, as it caters to the meatatarians. 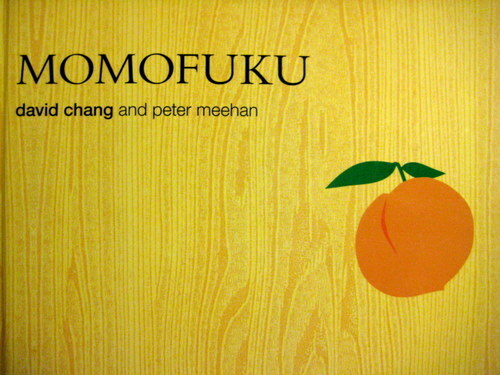 Coincidentally, my bro and his wife just gave me the momofuku cookbook for my birthday. They had no idea I had eaten at his restaurant, but just thought it was a cool cookbook. Cool, indeed! I can make the pork buns and the ramen now, if I felt so inclined! But really, I’d rather just go back to NYC and eat it! How funny!! I was there on the exact same day – but for dinner! My friends and I shared the three noodle dishes – they were all very good! But I didn’t think that the pork buns were all that! that’s crazy! that’s the second time (that i know of) where a fellow food blogger was at the same restaurant on the same day! 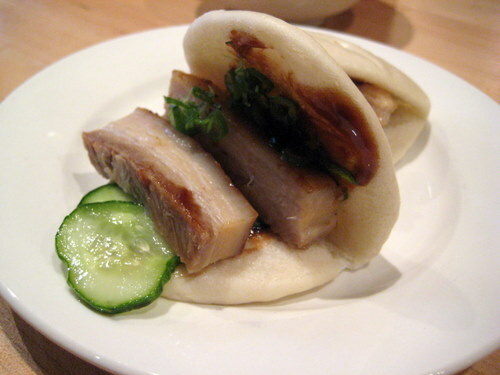 man, i’m still thinkin about them pork buns!